Taste test: Guest reviewer Melissa Cross, who enjoys an occasional snack of Wow! chips, reports: "They taste like a mix of regular Lays and potato sticks. If you didn't know they were fat free, you would not be able to tell. They were a little greasy. Overall they were average." Smell test: Kind of a strange smell. Not really potatoey, but not bad either. From the package: “Great Tasting Potato Chips ... Yes! "Potato Chips with NO FAT and HALF THE CALORIES of Regular Potato Chips ... Yes! ... From America's legendary chip maker Utz ... Yes! "That's right, Yes! 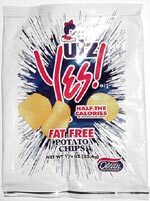 Brand Potato Chips are all that ... Great Tasting, No Fat, Half the Calories and made by Utz. We start with farm fresh potatoes, slice them extra thin and fry them in Olean® fat-free cooking oil. Olean® is made starting with natural, farm grown cottonseed and ads no fat or calories to the frying process, leaving the chips with all that natural potato flavor." This snack was discovered by Keith at Belly Delly Deli, on Broadway between 49th and 50th, Manhattan.